The team will hopefully be strengthened by the return of Ross Matheson and Andrew Penney, who will both be aiming for a top 10 finish. More than 200 runners are expected to take part in the Senior five miles race, with around 100 Young Athletes competing over two-and-a-half miles. While HW host the men’s match on Wimbledon Common, the Women and Girls teams are in action in the second Start Fitness Surrey Ladies League meeting in Nonsuch Park, Epsom. HW showed their considerable strength in depth by taking the team honours in an Inter-Club match over 4.9 miles in Richmond Park, hosted by the Bank of England, narrowly winning the 10-to-score contest with 152 points, beating Thames Hare & Hounds (158) and the Bank of England (258). Top finisher was teenager Zac Purnell who finished third of the 56 runners in 26 minutes 37 seconds. Another teenager, Hector Revill was eighth in 29:33. John Hazell (10th in 30:43), Fred Jimack (12th in 30:52), Richard Evans (14th in 32:18), John Querstret (16th in 32:47), Stewart Bond (17th in 32:59), top woman finisher Lisa Thomas (21st in 33:37), Ben Revill (23rd in 33:50) and Hannah Fernando (28th in 35:38) completed the scoring team. Ben and Eileen Toomer took part in the Abbott Dash 5km in New York (above) with Ben sporting the unfamiliar colours of the Central Park Track Club. 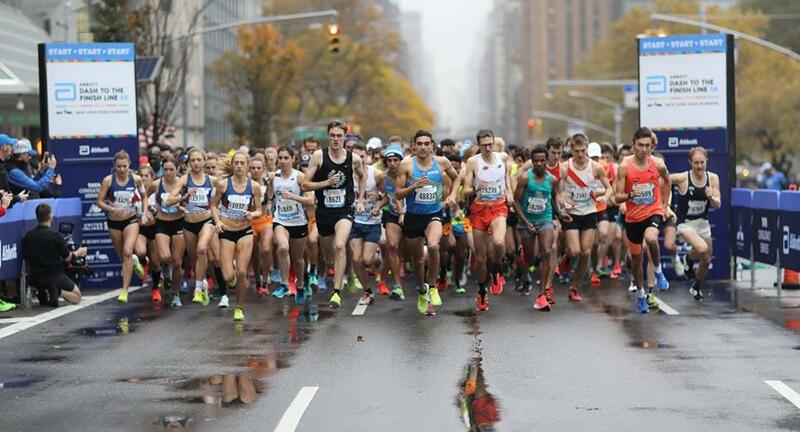 ‘The course was quite slow (a few uphills and sharp corners) but it was a lot of fun to race through the closed streets of New York’, says Eileen, who clocked 19:24, ‘Ben ended up running 14:54 to finish 12th (34th if you included the elite runners – two of whom had Olympic medals from 2016 – who set off 5 minutes before)'. Distance running supervet Tom Cheetham finished 11th out of 250 runners in the Thames Meander Marathon from Kingston to Barnes and back on Sunday in 3:12:30 to complete his 82nd marathon. Justin Reid was seventh out of 1436 runners in the Bushy Park 5km parkrun on Saturday in 16:44 with Dave Grima 10th in 16:51. Adam Harwood was once again the best of 16 Hercules Wimbledon runners on Wimbledon Common finishing third out of 621 runners in a personal best of 17:15, just one second faster than his previous best set in August. Teenager Henry Silverstein was fourth 12 seconds later while Gina Galbraith was top woman finisher in 19:05. As reported in last week's newsletter Alex Robinson and Liam White, both on their way back after injury, finished third and eighth in 17:25 and 18:58, respectively in the Amager Faelled parkrun in Denmark. Daniel Clarke, 13-year-old son of Fran and Dave Clarke, the Club's Chairman, chopped almost two minutes off his previous best in finishing 22nd out of 328 runners in the Kingston event in 20:05, ahead of Fran, who was third woman in 21:30. The event was won by HW's Jonny Earl in 16:03, just one second shy of his best set last month. Making it a hat-trick of Hercules Wimbledon parkrun wins was Ellen Weir who took the women’s event on the Isle of Wight in 21:08 with her dad Andy heading home the 337-strong field in 17:53. Meanwhile, Joe Toomey was second out of 640 runners on Clapham Common in a personal best of 16:44, seven seconds behind the winner, chopping 23 seconds off his previous best set in July.